Gandalf and Captain Picard will go at it again in the X-Men: First Class sequel X-Men: Days of Future Past. 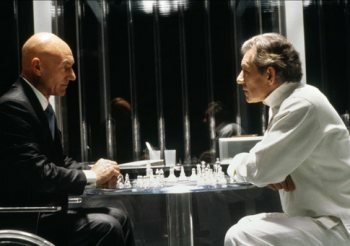 The best things about the X-Men film from 2000 were Patrick Stewart and Ian McKellan, who respectively portrayed Charles Xavier and Eric Lensherr, better known to the world at large as Professor X and Magneto. Hugh Jackman was a brilliant Wolverine and Ray Park was fun as Toad, but it was Stewart and McKellan who really anchored the thing. And while I didn't care much for the sequels, I didn't give up on the franchise until X-Men: First Class, which delved into the early days of the hated and feared mutant group and brought in James McAvoy and Michael Fassbender to portray the characters in their younger years. But today, director Bryan Singer announced that both actors will return to their roles in X-Men: Days of Future Past, the First Class sequel set for release in 2014. "Thrilled to announce @ianmckellen118 & @SirPatStew are joining the cast of #XMEN," he tweeted. Making things even more interesting, however, and also more confusing, was Singer's tweet immediately prior to that one, in which he said that McAvoy and Fassbender would also be returning. How's that going to work? Days of Future Past - the comic, not the film - is actually an alternate future storyline in which the X-Men failed to prevent the Brotherhood of Evil Mutants from assassinating Senator Robert Kelly. "In this future universe, Sentinels rule the United States, and mutants live in internment camps," as Wikipedia explains it. "The present-day X-Men are forewarned of the possible future by a future version of their teammate Kitty Pryde, whose mind traveled back in time and possessed her younger self to warn the X-Men." Since it's safe to assume that the movie will follow more or less along the same lines as the books, Stewart and McKellan will presumably portray their older, alternate-universe selves while McAvoy and Fassbender carry on with the "real" timeline. This bodes very well for the film, not just because of the return of two really great actors but because as any comic fan will tell you, alternate timeline stories are the best. Writers are given an incredible amount of freedom because they don't have to worry about continuity or even keeping characters alive, and the results tend to be pretty spectacular. If Days of Future Past can make that happen on the big screen, I may just have to see it. X-Men: Days of Future Past is currently scheduled for a 2014 release.